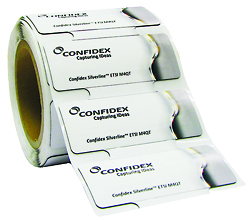 The Silverline label is a, Gen2, ISO 18000-6C, UHF thermal transfer printable Mount-on-Metal label. The labels come with a synthetic face stock and with permanent, general purpose, adhesive. They are compatible with most Datamax, Sato, Toshiba and Zebra UHF printers. They have been designed to be affixed to a metal surface and operate in temperatures of -35°C to +70°C (-31°F to +158°F) with 50% RH.